If a visa is required, Cambridge Programmes will supply all the necessary supporting documents and ensure that the application forms are filled in correctly. For this particular service, there will be an administration charge of £100. Students from participating schools should follow their teachers’ advice. Private participants should contact us by email for advice on which flights to book as it is important to co-ordinate arrival times for everyone for pickup at Heathrow Airport. Cambridge is a wonderful centre of learning with 120,000 inhabitants, 18,000 students and over 4 million visitors every year. The blend of the old, stretching back 2,000 years to the Romans, followed by the founding of the first College in 1284, up to the present day ultra-modern architectural buildings, housing the Law Faculty and the new Cavendish Laboratory, are the backdrop to this inspirational place of learning. We should also not forget Cambridge’s illustrious research reputation from Sir Isaac Newton’s Laws of gravitation and light, Rutherford and Cockcroft’s splitting the atom, up to two of Churchill College’s Nobel Prize winners, Francis Crick who discovered the secrets of DNA and Tony Hewish who first discovered Pulsars. Cambridge has a rich literary history too. So we take full advantage of this within our Academic English and English Literature programmes, including a visit to the famous tea garden at The Orchard in Grantchester, beloved by the famous poet Rupert Brooke. The magnificent Law Faculty building designed by Norman Foster and the historical Cambridge University teaching hospital, Addenbrookes, are focal points on our Law Induction and Medicine Programmes. 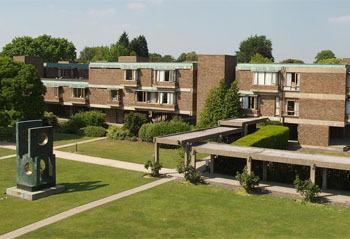 Cambridge Programmes is based in Churchill College and Fitzwilliam College, two of the thirty-one Colleges which make up the University. On arrival, you will be given a map of the College and your mentor will take you to your bedroom and show you the dining hall, classrooms, supervision room, common room for evening events and activities. Boys and girls are on separate staircases or floors. It’s strictly forbidden for boys to go into girls’ rooms or vice versa. A mentor will stay in the same block as you. All meals will be provided in the college hall except when we go out on trips. All tap water is very safe for drinking so bring along a water bottle to refill for outings. Your mentor will show you how to operate the washing machines if you need to do some washing. It usually costs a couple of pounds for washing and drying your clothes. Laptop, tablet or smartphone. Wifi is available in College. Personal toiletries e.g. shower gel, shampoo. Lesson materials e.g. notebook, pencil case, colour pens and pencils. Buy some small souvenirs for your Mentors. Students are divided into mentor groups. The average is one mentor per six students. Mentors are undergraduates or graduates of Cambridge University. They will look after you 24/7, as well as organising activities and providing assistance to teachers.